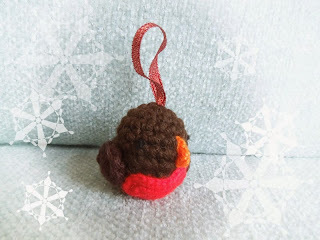 This pattern is for my lovely American and Canadian friends out there but the wonderful thing about this crochet pattern is that it is an adaption of my recent crochet video tutorial on how to make a little bird which you can watch here! So you can use this main body pattern to make many different types of birds. See my Robin below as another example. Pause your work here and start on the other body parts. This makes it easier to sew them on and hide the ends on the inside. Join Y with ch1, turn, 2sc in 1st st and in ea st along - (26) Fasten off and sew both wings onto your main body, making sure they are placed correctly (you want the fatter part of the wing to be at the tail end of your bird). To make the eyes take two short lengths of Y and tie 3 knots into the middle of each length. Sew both ends into your main body and tie on the inside. To make the wattle skin, take R and ch6, then crochet [1sc, 1dc, 1tr] in 2nd st from hook, [1tr, 1dc, 1sc] in next st, sl st in next st, [1sc, 1dc, 1tr] in next st, [1tr, 1dc, 1sc] in last st. Fasten off and sew onto your main body under the eyes. Using Y, ch4, 1sc in 2nd st from hook, 1hdc in next st, 1dc in last st. Fasten off and sew onto main body over the top of your wattle skin. sc2tog 4 times - (4) Sew remaining gap closed with tail yarn. Fasten off and tie in all tails. Nursery birds using same main body pattern. If you would like to make the smaller birds, simply use DK/Light worsted weight yarn and a 3mm crochet hook for the main body. To make the smaller wings use a 2.5mm crochet hook or similar and ch6, sl st in 2nd st from hook, sl st in next st, 1sc in next st, 1hdc in next st, 5dc in last st. 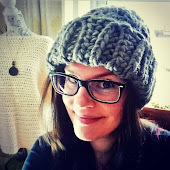 Turning your work clockwise and crocheting back into your foundation chains crochet 1hdc in your 2nd foundation ch (your 1st was the last st where you worked 5dc), 1sc in next ch, 1sl st in remaining 2 chs, fasten off and sew onto your main body. See video above for instructions as well. Robin version using same main body pattern. Ch1, don't count as st, turn, sc2tog - (1) Fasten off and sew onto your main body sideways. DK/Light worsted weight yarn in red, green and pale yellow (or white, or pale green). 1sc in ea st around - (6) Do not join rounds. 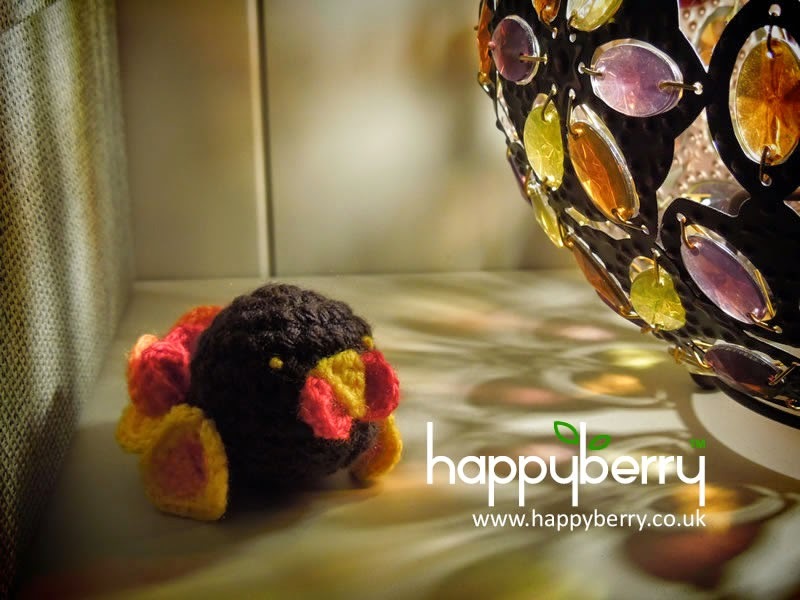 Stop here and using PY and a yarn needle, sew some small sts onto your strawberry. Be careful not to pull to tightly otherwise you may distort your strawberry shape. Fasten off PY. 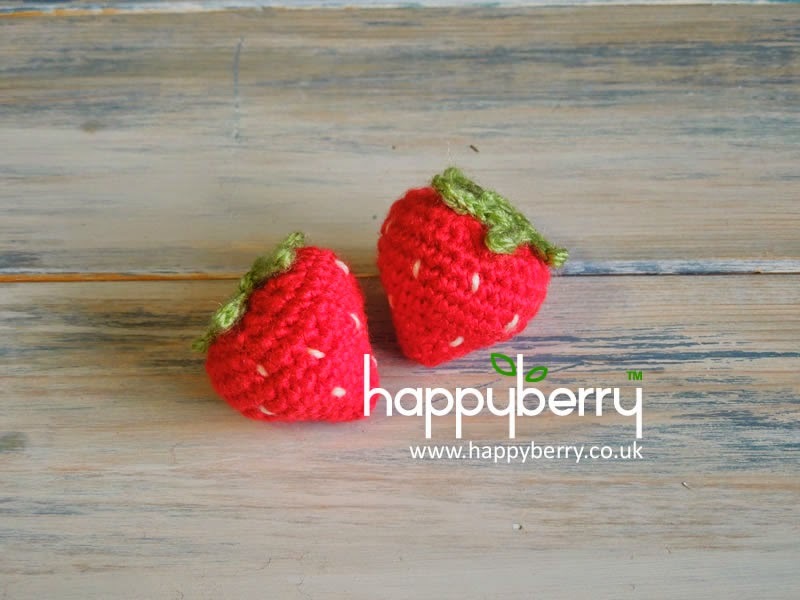 Stop here and stuff your strawberry with either toy stuffing or yarn scraps. Fasten off R and using remaining tail end and a yarn needle sew your remaining gap closed. Do this by repeatedly sewing into the next 2 sts and draw-stringing your hole closed. Hide your tail ends on the inside of your strawberry by sewing through your strawberry a few times (without pulling too tight otherwise you will distort your strawberry shape), push your strawberry down gently and keeping your tail end taut, cut your yarn, let go of your strawberry allowing it to bounce back and doing so will hide your tail end on the inside. Ch4, sl st in 2nd ch from hook, 1sl st in next 2 chs, 1sc in same st as chs, *1sl st in next st on main circle, ch4, sl st in 2nd ch from hook, 1sl st in next 2 chs, 1sc in same st as chs* repeat from * to * until end, sl st to join round, fasten off and use remaining yarn to sew onto your strawberry, hiding your tails end the same way as before. 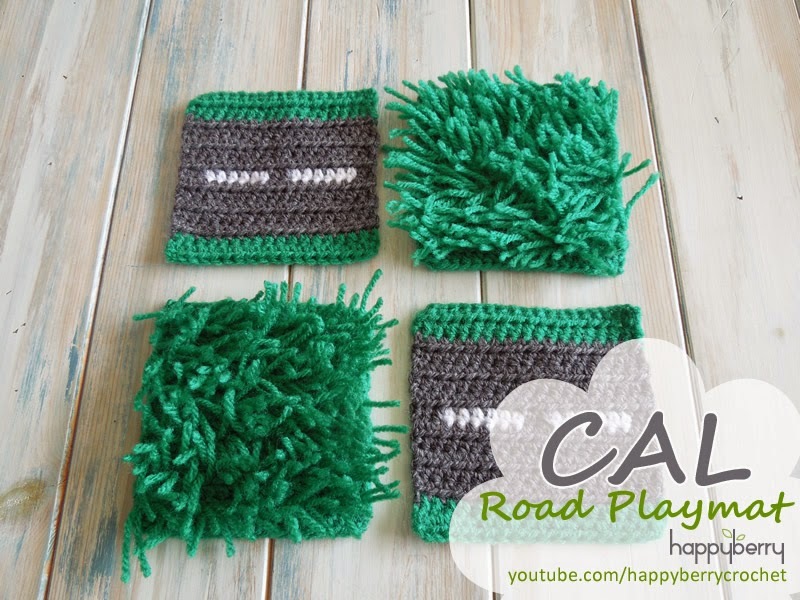 This pattern is oh so simple to do but I am working on a video tutorial of it as well which I will share when it has finally uploaded. No-one likes to wait for a pattern right? so here is the written version first! Yay! I hope you enjoy making these as much as I loved designing them. See notes for larger/smaller sizes. 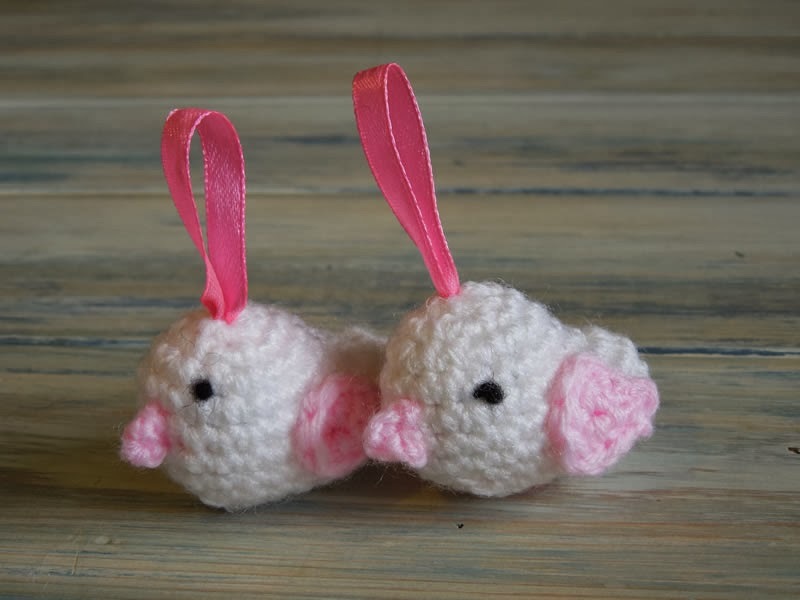 For longer or shorter slippers crochet more or less rounds on rounds 6 – 13 or rounds 14 – 22. For thinner or wider slippers crochet more or less chains at the beginning or work less increase rounds at the beginning. Video tutorials relating to this pattern. Using W and an I/9 (5.5mm) crochet hook, ch9, 2hdc in 2nd st from hook, 1hdc in next 6 sts, 5hdc in last st. Working back into your foundation chains again work 1hdc in 2nd chain along (your 1st chain was the same as the last chain from the first row, where you worked 5hdc), 1hdc in next 5 chs, 3hdc in last ch – (22 total sts from both rows). Ch1, TURN, hdc3tog – (1) Fasten off and tie in all tails. Re-join W anywhere on back on slipper, near the edge and work 1sc neatly around opening of slipper, join G with sl st to join round – (st count is not important). Continuing in G, work 1 sl st in ea sc around, sl st in first sl st to join round. Fasten off and tie in all tails. Repeat rounds 6 – 28 of left slipper. I designed this poppy actually a few years ago now on Remembrance Sunday here in the UK when raising money for the Royal British Legion, as my family personally lost at least 2 uncles in WW1, which I discovered when researching my ancestry. I felt designing this poppy was my way of remembering their courage but also the sorrow they left behind. I now share this poppy pattern with you so you can remember your heroes in your own personal way. 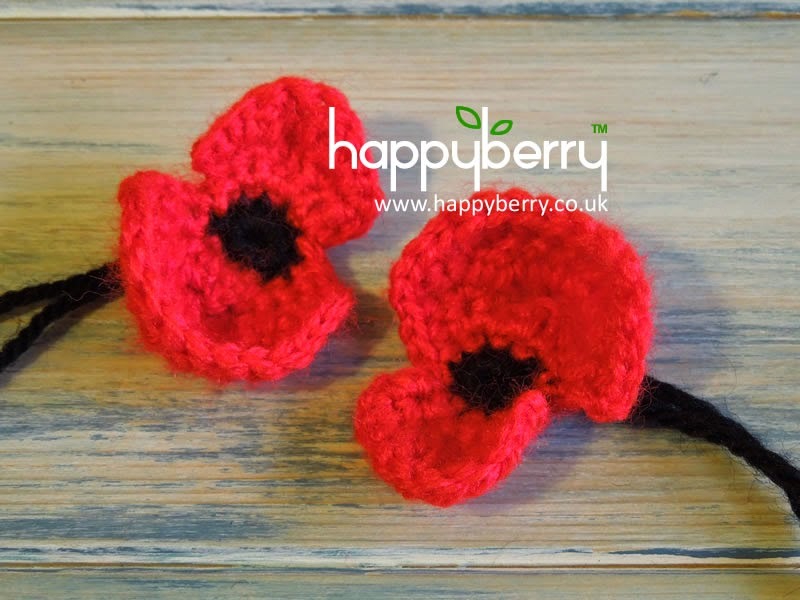 You are more than welcome to sell poppies made from this pattern to raise money for charities of your choice. Not essential for this project. OR ch4, sl st into 1st ch to form a loop. Work 1sc neatly down edge of petal back to black, 1sc in next 5 sts (along the black), sl st in next st to match up red yarn.